Provisional Act is delighted to announce that Provisional Scratch Night - the sold out event that premiered last September - is coming back! Only bigger and better this time and in the form of a 4 day festival! 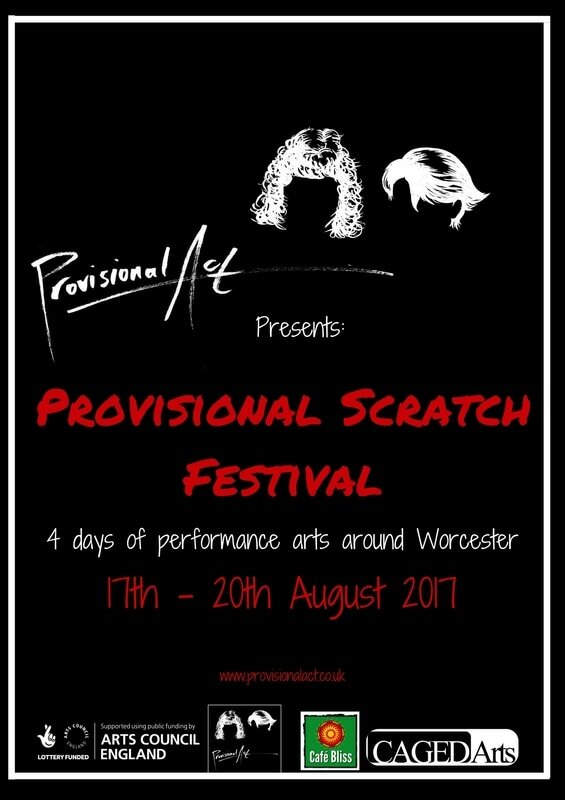 Venues across Worcester will host a variety of emerging artists and enable them to showcase their amazing talents! Spread across 4 days, artists of all art forms - including dancers, comedians, poets, musicians, theatre makers and drag artists - will delight Worcester audiences and help create a unique atmosphere. Tickets range from £3 to £6 and can be bought either online or on the door. Our afternoon events give you a two-hour whirlwind tour featuring the best emerging artists who work in the city. From musicians, to plays staged outdoors, to dancers who dance in unexpected places; these events will allow you to experience something different whilst you grab a bite to eat or a slice of cake. First Draft is all about that moment you’re not quite sure about. It’s a space for those people who have been writing for a while, but haven’t plucked up the courage to stand on a stage. It’s a space for those more confident performers with a piece that isn’t quite flowing properly, and they want to test it out. It’s a space for those who just love to perform; and want to practice. It’s a space for those who just want to sit and listen to some fantastic performers try something. A night of glitter, glamour, song and drag with Worcester’s fantastic Ginny Lemon. We’re going to be honest, we don’t know what to expect – but what we do know is that it will be fantastic and you’d be a fool to miss it. Featuring drag acts from around the West Midlands, this is a night that you're sure to remember. A proportion of all ticket sales will go to supporting Worcestershire Pride. Admiring La Stupenda, a play by Daniel Somerville. Daniel is a lecturer at the University of Worcester, and the piece formed a part of his PhD research which focused on the body’s place in opera. La Stupenda is a nickname given to the opera singer Joan Sutherland, and means The Stupendous in Spanish. Joan was said to possess ‘’a voice of beauty and power, combining extraordinary agility”. We can’t speak for the fantastic Dr Somerville’s operatic capability, but we can tell you that it’s a show not to be missed! If you love music then you are in for a treat. Following on from a dazzling day of arts at Wayland’s Yard, the Provisional Scratch Festival comes to a close with a night to remember at Café Bliss.